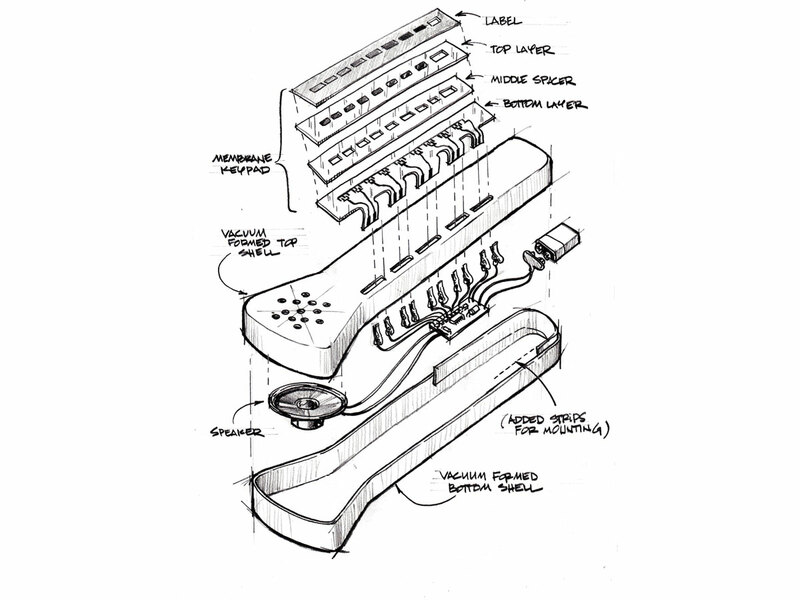 Now you can make your own custom version of one of the most iconic musical toys of the 80's. 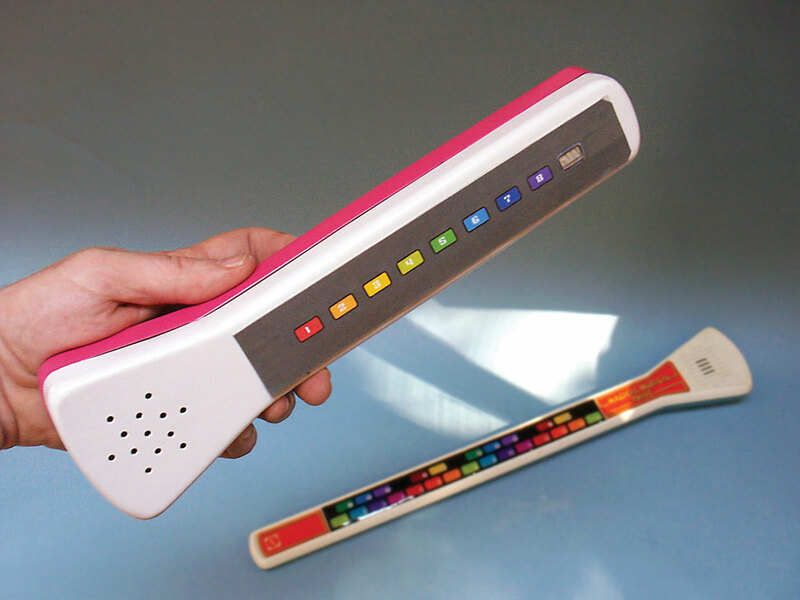 Perhaps the most iconic 80’s music toy was the Magical Musical Thing from Mattel. The TV commercial featured a kid playing melodies with one finger on the toy’s keypad strip — and finishing by playing it with his head! It featured a sound circuit that was designed around the cheapest and most basic building block of digital electronics: the 4049 CMOS hex inverter chip. Usually used for decoders and multiplexers, the lowly 4049 was re-imagined by Mattel’s thrifty engineers to create musical tones. Three of the IC’s six logic gates were linked head-to-tail with a resistor and capacitor to create a simple, self-oscillating on-off/on-off square wave generator. The output of this oscillator was hooked up to the remaining three inverters in parallel. Their combined outputs were just enough to directly drive a speaker, with no audio amplifier needed! A network of resistors created the various musical tones. This was done using a cleverly designed membrane switch pad. The top and bottom layers were made from a single, folded piece of Mylar, printed with conductive silver traces connecting strips of resistive paint. The middle layer was a die-cut insulated spacer with holes positioned to make touch points, each labeled for a different color-coded musical note. Touching the membrane pressed together two conductive strips, which completed the circuit through a path of resistors, producing a single musical tone. The shorter the path, the less electrical resistance, the faster the circuit oscillates, and the higher the pitch! Beep boop! Follow the color-coded notes to play a song or slide the “Thing” over your body for a flourish of notes. Now you can make your own custom version of this classic 80’s toy. Wire up the circuit, paint a membrane keyboard, and make a housing (or put it in some repurposed container). This DIY re-do has a new added feature: a circuit-bending touch point. This exact reproduction circuit is quite simple with a minimum of components. You can easily solder it up with point-to-point wiring on a perfboard. Layout isn’t critical, but I placed the 8 trimmer pots in one neat row. Cut the board down for a minimum size after the board is done. Instead of the fixed, printed resistors, this version has a trimmer pot for each of the eight notes so you can tune them individually. Strip the ends of the ribbon cable and solder one wire to each of the trimmers and a mini alligator clip to each of the other ends. Test the circuit: add the battery and touch the clip at point “A” to each of the other clips. You should hear a beeping tone for each clip. Twist the trimmer pots to adjust the musical tones’ pitches. To make the keypad, tape a piece of Mylar over Template #1. If you're using frosted Mylar, be sure to lay it frosted side down. Trace the cut outline with a thin permanent marker. Use the conductive ink pen to trace the circuit layout. Be sure to shake the pen well between strokes — there’s a ball inside that works as an agitator. You’ll have to both very gently squeeze the barrel and press the valve tip down at the same time, as you pull the pen across the Mylar — that will make a uniform, generous line. Join line segments while still wet for best conductivity. Don’t puddle the paint on too thick — it’ll crack instead of flex when the Mylar is curved. When the paint is dry, test each of the traces with a continuity tester and touch up with the conductive ink as needed. Use Template #2 to make the other half of the keypad. 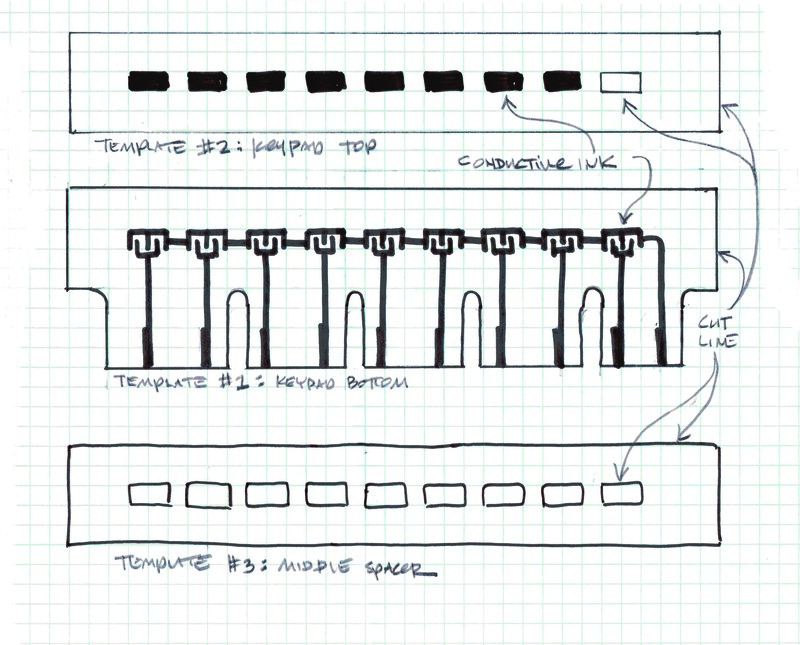 Template #3 needs no conductive ink — just trace the outline and cut out the holes for middle spacer layer. Tape the layers together temporarily and hook up the clips. Press the switches to test your circuit. Again, touch up any traces or switch pads with a little extra conductive paint, if needed. Trim the layers to size with your craft knife. Use the paper punch to make radiused inside corners as strain relief. Use double-sided tape to fasten the membrane switch layers together (but don’t put tape over any traces). I added a colorful label on top with numbered touch points. Reconnect the clips and play away! Use a guitar tuner app to adjust the trimmer pots for the notes you want. Tune the eight notes to a “do-re-mi” scale for a most useful set of notes. Or you can tune them to anything you want — including the first eight notes of any song for easy auto-play. Just swipe your finger across the keypad to play! Lick your fingertip and touch the last position for fun circuit-bending sounds, from a low growl to a high squeal. To finish your project, install it in a sturdy housing like this mini version of the original Magical Musical Thing. I made a symmetrical wooden pattern and used it to vacuum-form a top and bottom (check out my tutorial from Make: Volume 11). I trimmed them and milled some slots for the keypad’s hook up, then mounted the speaker, circuit board, and battery inside. I taped the keypad in place and attached the clips before closing the top and bottom shells. Alternately, you can repurpose a container you already have, or 3D print a custom case. Looks and plays great!